The following is a brief summary of the COI requirements that must be completed by investigators prior to the COI Program being able to complete its review. Each investigator (i.e., any individual responsible for the design, conduct, or reporting of research) must complete an annual disclosure of outside interests through the COI Disclosure System. Where an investigator has disclosed an outside interest, the COI Program reviews all of the investigator’s research against that interest to determine whether a conflict exists. In order for the COI Program to conduct its review, the research project must appear in the COI Disclosure System. For sponsored projects that have reached the Institutional Proposal stage, this should happen automatically. 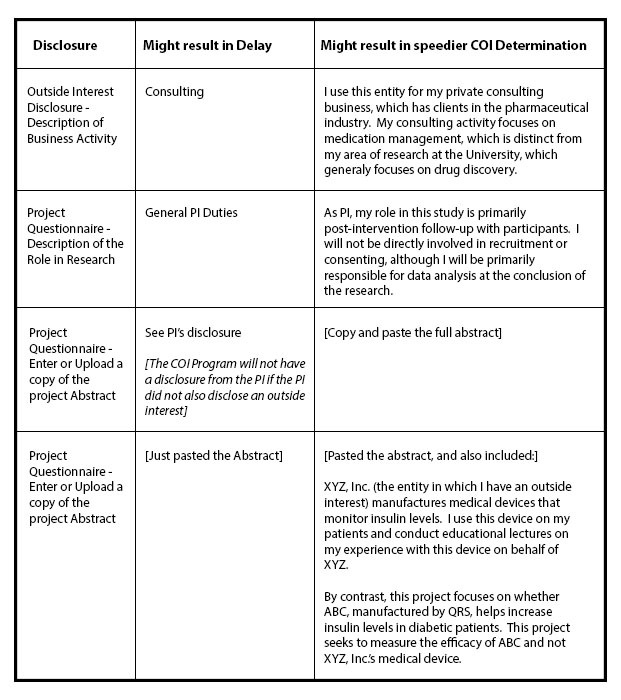 For most other projects, each investigator will need to manually enter the project into the COI Disclosure System, providing sufficient detail to allow for a meaningful review by the faculty-based Institutional Review Committee. Instructions for manually entering the project into the COI Disclosure System can be found in STEP 6 on page 5 of these Instructions for using the COI Disclosure System. The below FAQs will help explain the COI process as it relates to your ‘Application for Human Research’ submission to the Human Subjects Protection Program (HSPP). However, you may also find it helpful to review this flowchart, which provides an overview of the COI process as it relates to when you may submit your ‘Application for Human Research’ to the HSPP. What is the purpose of COI review? The University’s Individual Conflict of Interest in Research Policy seeks to identify the potential for bias in research and, where identified, to mitigate that risk by managing or eliminating the conflict. How does the COI Program identify conflicts? The COI Program collects disclosures from researchers across campus about their outside interest(s). Then the COI Program works with the faculty-based Institutional Review Committee (IRC) to compare those outside interests against the researcher’s University-based research projects to determine if there is a Financial Conflict of Interest. For a more complete overview of the COI review process, please see the homepage for the Individual Disclosure Process, here. What is a Financial Conflict of Interest (FCOI)? “Relatedness” means that it may reasonably appear that decisions made by the researcher in the performance of their Institutional Responsibilities could directly and significantly affect the value of (or be in conflict with) their outside interest(s). Relatedness includes situations in which a researcher’s outside interest(s) would reasonably appear to affect, or to be affected by, the individual’s Research or other Institutional Responsibilities, as well as situations in which the Outside Interest involves an entity whose financial interests would reasonably appear to affect, or be affected by, the researcher’s Institutional Responsibilities. Importantly, a finding of a FCOI is not a judgment on whether the researcher would deliberately make choices in the Conduct of Research or the performance of their Institutional Responsibilities based on considerations related to their outside interests. Rather, “Relatedness” refers to the condition in which it may reasonably appear that choices made in the performance of the researcher’s Institutional Responsibilities could be directly and significantly influenced by the existence of outside interests. Who must disclose whether they have outside interests? This includes but is not limited to the Principal Investigator (PI), Co-PI, Co-Investigator, Project Director (PD), Co- PD, Senior/Key Personnel, and any other persons involved in the Conduct of Research, regardless of title or position, who are responsible for the design, conduct, or reporting of Research performed by or under the auspices of the University. This may include students, trainees, collaborators, volunteers, and Consultants if those individuals have some degree of independence in performing some aspect of design, conduct, or reporting of the Research. The term “Investigator” does not include individuals whose performance within the Research is purely ancillary or occurs solely under immediate supervision.” Note: This may be a broader universe than the individuals included on the HSPP’s List of Personnel Form. Are there disclosure requirements beyond simply updating my outside interests on an annual basis or when they change? Yes, you may need to complete a “project questionnaire” (see below FAQ for more on the project questionnaire). This applies only if you have disclosed the existence of an outside interest. In other words, if you have completed a disclosure that says you have no outside interests, your only ongoing obligation is to recertify this on an annual basis. What is the Project Questionnaire? The Project Questionnaire is a portion of the COI disclosure system that solicits information from you about a particular research project. It is important because the COI Program and Institutional Review Committee use this information to determine whether there is a Financial Conflict of Interest between your outside interest(s) and the research project. Thus, the more details you provide, the less likely there may be delays caused by the COI Program’s need to follow-up with you for more information. Please use terms that someone who is not familiar with the science or your discipline can understand. The project questionnaire asks for (1) basic details about the project, (2) a summary or abstract of the research, and (3) a preliminary assessment by you of whether the project is related to your outside interest. (The final assessment will be made by the COI Program and the Institutional Review Committee. How can I prevent delays in COI review? The most common reason a COI review may be delayed is because an Investigator has not provided the COI Program with sufficient information to allow for a meaningful review of their outside interest against a research project. I don’t see my project in the COI disclosure system. Why not? And what should I do? The COI Disclosure System imports Institutional Proposals and Awards from the UAccess Research system and protocols that have been submitted to the IRB. Thus, if your research project is not reflected in UAccess Research as either an Institutional Proposal or an Award, it will not automatically appear in the COI Disclosure System. For projects that are not automatically imported, you will need to manually enter the project into the COI Disclosure System. To do this, please see STEP 6 on page 5 of these Instructions for using the COI Disclosure System. The PI or other investigator on the project has not completed their annual disclosure of outside interest(s) through the COI Disclosure System. The PI or other investigator has disclosed an outside interest(s), but the protocol needs to be added to their disclosure to allow for COI review. The COI Program is still conducting its review of the PI or another investigator’s disclosed outside interest(s) against the proposed research. This flowchart may help you identify which of these steps needs to be completed. What is the status of the COI Program’s review of my project? The COI Program reviews disclosures on a weekly basis and the Institutional Review Committee (IRC) reviews completed disclosures once a month, typically on the third Wednesday of the month. Please see the IRC’s calendar for more information. Any investigator can always check the status of their disclosure by logging into the COI Disclosure System. OK, so I am confident that everyone on the project has disclosed through the COI system, and the COI Program’s review is complete. Now what? Once the COI requirements for this project are complete, please then resubmit this application, in full, to VPR-IRB@email.arizona.edu. Please note, depending on time of resubmission, new signatures may need to be obtained. If you have questions about how to complete any of the COI requirements, please contact COI Program at COI@email.arizona.edu.